HTTP Downloader is a download manager for the HTTP(S) protocol. Maximize your download throughput by utilizing high performance input/output completion ports (IOCP). HTTP Downloader can open thousands of connections at a time and consumes very little system resources. WARNING: Using this software to download from OlderGeeks could get your IP address banned due to protections on our site. How ironic is that? 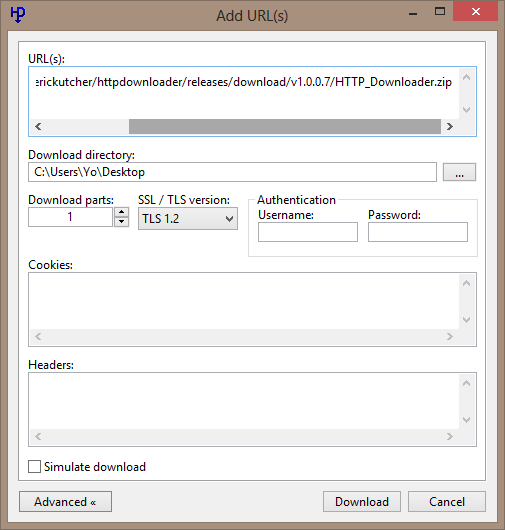 HTTP Downloader is a high-performance, multi-part download manager. You can Start, Pause, Stop, and Queue up to 100 downloads at a time. Each download can be split into 100 parts. That's 10,000 connections! Drag and drop links into the program's main window or, select File > Add URL(s)... to bring up the Add URL(s) window. From here you can select the download location to save the files. The Advanced button allows you to configure the number of parts to split each download, the SSL / TSL version to use for HTTPS connections, authentication information (basic or digest), and any necessary cookies, headers, and POST data. 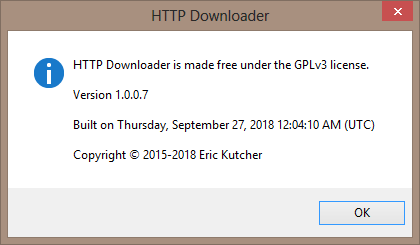 Clicking the Download button will begin the download(s). HTTP Downloader has various options to configure the behavior of the program. 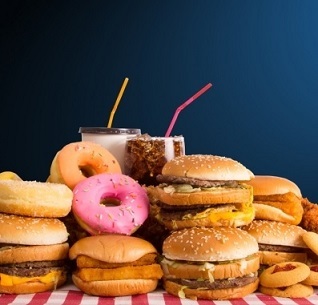 The options can be accessed from Tools > Options... The first tab that appears is the General tab. In it you can choose to display the System Tray icon which will generally appear on the lower right corner of the taskbar (next to the clock). The program can be set to minimum to the System Tray instead of to the taskbar and close to the System Tray instead of exiting the program. Always on top will cause all the program's windows to appear on top of every other program's windows. Enable download history will save the entries in the main window so that they can be loaded the next time the program starts. If left unchecked, then any download history will be lost. Enable quick file allocation will quickly preallocate a file on the disk by not overwriting the file location with zeros. Windows, by default, will write zeros to a preallocated file as a security measure. This can be bypassed with Administrator access. Allow[ing] one instance of the program to run will prevent other copies of the program from interfering with the currently running copy. You can enable a URL drop window to quickly drag and drop URLs into instead of the main window. It'll remain visible on top of other windows unless you either right click it and deselect Always on Top, or use your mouse to middle click the window. Drag and dropped URLs can also be set to download immediately without bring up the Add URL(s) window. The Default download directory sets the location in the Add URL(s) window. 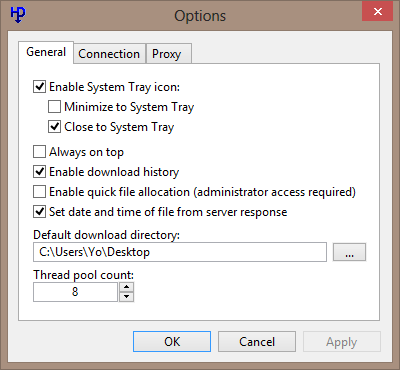 Finally, the Thread pool count is the number of threads the program will use to manage all the connections that it makes. The Connection tab lets you set how many downloads can be done at a time, how many parts to split each download, and how many times to retry failed and timed out downloads. You can also enable a web server to allow remote connections to add URLs to download. The browser extensions require that the web server be enabled in order to communicate with the program. The web server can ask for a username and password to authenticate a remote connection. It supports either Basic or Digest authentication. By checking Enable SSL / TLS you can load your security certificate files and choose the appropriate SSL / TLS version to allow for HTTPS connections. The security certificate files can be in the form of either a PKCS #12 file, or a public and private key pair. If the PKCS #12 file has a password associated with it, then you'll want to enter the password in the password text box. Creating a security certificate is somewhat involved, but there are plenty of guides online. Do a Google search for "Create a self-signed certificate with OpenSSL" and it should explain things better than I could. The Proxy tab lets you connect to both HTTP and HTTPS proxies. You can also set any authentication information (basic or digest) that the proxies require. The main window shows a listing of downloads and a status bar. You can enable or disable the status bar as well as a toolbar from the View menu. You can change the units of measurement (bytes, kilobytes, etc.) for the status bar by clicking on the status bar panels. The same can be done with the Downloaded, File Size, and Download Speed columns by holding Ctrl and clicking on their respective column headers. The first measurement state is set to auto adjust when the number increases. The other four states will display only bytes, kilobytes, megabytes, and gigabytes respectively. Each column can be dragged into a new position and if you'd like to show or hide any, then right click on any of the column headers to bring up their menu. If you'd like to run the program in portable mode, you can start it from a command-line with a "-p" switch, or create an extensionless file named "portable" in the same directory as the executable. Added regular expression filter in Add URL(s) window. Added SOCKS 4/4a/5 proxy support. Fixed requests on non standard ports. Fixed notification counts increasing from retries. Prevented incomplete command-line arguments from being processed. Allowed restarting state to be stopped after connect is posted. Compiled latest zlib for 32-bit and 64-bit releases. Updated extensions layout and regular expression filters. 199 740 Eric Kutcher <img src="https://www.oldergeeks.com/downloads/gallery/thumbs/HTTP Downloader6_th.png"border="0"> Apr 17, 2019 - 11:04 1.0.2.1 273.2KB ZIP , out of 1 Votes.